Immediately southwest of Stonehenge, exactly on the Winter Solstice Sunset alignment, lies a small wood called Normanton Gorse. It's just to the west of the main part of a barrow cemetery called the Normanton Down group - a magnificent assembly of at least 26 Bronze Age burial mounds, plus a small long barrow. "...contained an interment of burned bones, deposited in a shallow oval cist, with the fragments of a small cup, and a bone pin." "...which is a low barrow, elevated only two feet above the plain, we found a skeleton, with its head laid towards the south-east, and with it a drinking cup. Eighteen inches lower down was another, lying on its left side, with its head towards the east ; and beneath it, we discovered a cist of the depth nearly of six feet, cut in the chalky rock, and containing the primary interment, of a young man, with his head lying towards the north, and a drinking cup close to his right hand ; it had been neatly ornamented, but was broken by the pressure of the incumbent earth." Together with others north, south and west of Normanton Gorse, these barrows comprise one of the largest Bronze Age cemeteries in the Stonehenge landscape. Within one of them - Bush Barrow (Wilsford G5) - was found the most spectacular collection of Bronze Age grave goods anywhere in Wessex and perhaps anywhere in Britain. This is known as the Bush Barrow Treasure, excavated by William Cunnington in 1808 under the sponsorship of Colt Hoare and now - thankfully - held in Wiltshire Museum in Devizes. Apart from the astonishing daggers, fossilised coral mace head, zigzag bone inlays and a fine axe there was also some exquisite goldwork - a small diamond-shaped brooch, a belt hook and a large diamond-shaped beaten-gold object known now as the Bush Barrow Lozenge. 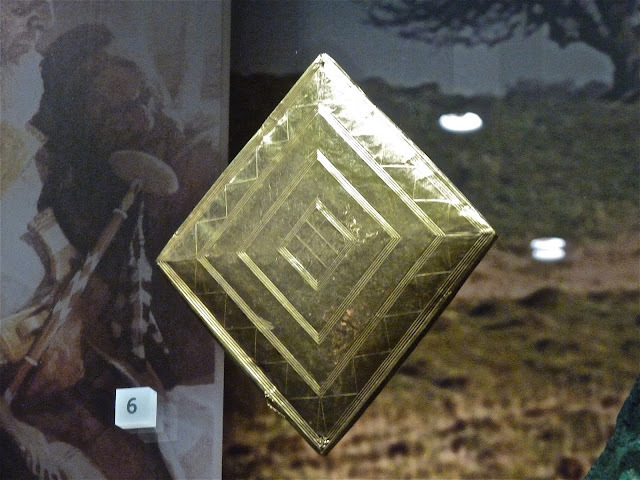 The gold, which is beaten very thinly, is mounted on a wooden plaque about 7" x 6" and it was found lying on the chest of the man who was buried in Bush Barrow and so it's assumed to be a breastplate. Inscribed in its surface are extremely fine lines and zigzags that have been engraved with a precision that is hard to comprehend given what we know of the available technology at that time 3,900 years ago. The sharp angle of this lozenge is 80° - the same angle between Summer Solstice Sunrise and Winter Solstice Sunrise (or Winter Solstice Sunset and Summer Solstice Sunset, if you prefer) at the latitude of Stonehenge and 4,500 years ago. But the title of this article is "A curious similarity of shapes" and I opened by telling you where Normanton Gorse is in relation to Stonehenge. So why have I been rattling on about barrows and grave goods? The hunt is now on to discover when, exactly, Normanton Gorse was planted. We have to assume, I think, that it post-dates the discovery of the Bush Barrow Lozenge in 1808 and was perhaps planted to echo the shape of the fine gold object found only a few hundred yards away. If any evidence emerges that it was planted earlier than 1808 then we have either a rather large coincidence to explain or someone independently knew the importance of this particular shape in connection with Stonehenge. Please be aware that the barrows of the Normanton Down group are all on private land, as is the wood itself. 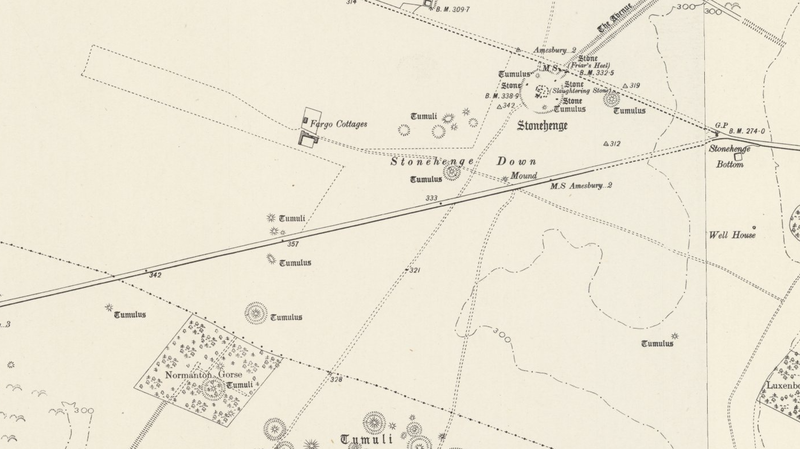 The Stonehenge Barrow Map will show you where all the barrows are, with clickable markers that will describe them and their contents. If you're out walking the landscape there is a public right of way (byway) running from the A303 to the A360 and a permissive path through the National Trust land to the north of the Normanton Down barrows. 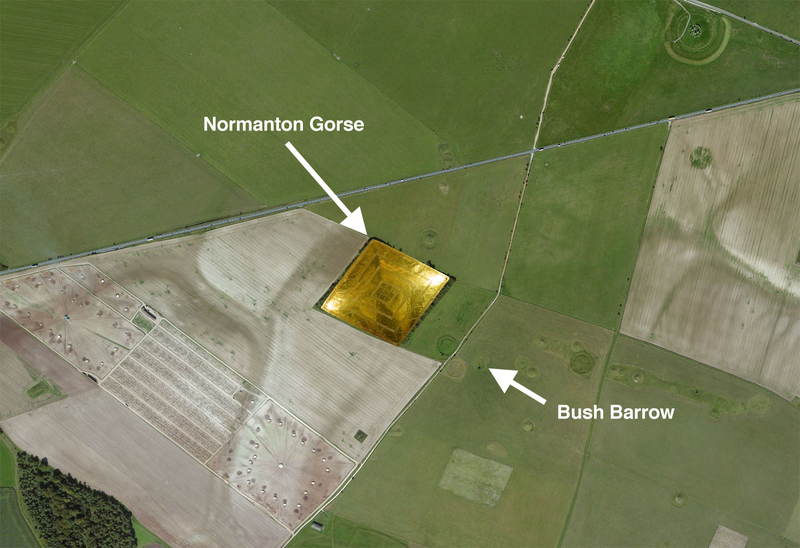 Finally, if anyone does happen to know exactly when Normanton Gorse was planted, please get in touch.